Metformin is sold under trade names Glucophage, Riomet, Fortamet, Glumetza, Obimet, Dianben, Diabex, Diaformin, and more. Metformin is currently one of just two oral anti-diabetic drugs included in the World Health Organisation Model List of Essential Medicines. Metformin can help to help people with diabetes lose weight, and also helps to reduce LDL cholesterol and triglyceride levels. Metformin is of the biguanide class of diabetes drugs. This drug class originated with the French Lilac. 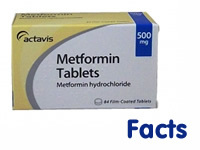 Metformin was approved by the US Food and Drug Administration in 1994. Metformin is the only diabetes drug shown to protect against cardiovascular diabetes complications. Metformin is prescribed for people with type 2 diabetes, usually in cases where the patient is also overweight/obese and resistant to insulin. Metformin, although not yet licensed, is being used in polycystic ovary syndrome (PCOS). NICE (National Institute for Health and Clinical Excellence) recommend that women with a BMI (Body Mass Index) of over 25 and PCOS are prescribed Metformin. Metformin is not prescribed in cases where it could increase the risk of lactic acidosis. Lactic acidosis is the most serious side effect of Metformin, but it is very rare. Metformin suppresses hepatic glucose production, increases insulin sensitivity, enhances peripheral glucose uptake, increases the oxidation of fatty acids and lowers absorption of glucose into the gastrointestinal tract. Metformin is commonly prescribed in 500mg, 850mg and 1000mg tablets. The most common dosage of Metformin is 500mg.